Real photo post card measuring 3.5 x 5.5 inches. Undated and unidentified, although the paper manufacturer’s markings (AZO, four triangles all pointing up) narrow the date range to 1904-1918. These two look rather sure of themselves, don’t they? I can’t tell if the tie on the left is undone, or if it’s a style of neckwear with which I’m not familiar. Either way, his looser look is in definite contrast to the buttoned-up look of his companion. They each have something between the fingers of their hands. Cigars? I’m not quite sure, though I’m not sure what else they would be. I’m 99% sure they’re cigars. The neckwear on the guy on the left reminds me of a Boy Scout neckerchief with a metal slide, because there is a pin or some other metal-like thing on it peeking out from under the collar of his jacket. Given his age I’m sure that’s not what it is, but that’s what it made me think of. I had the same thought about a neckerchief, but I agree, a Boy Scout neckerchief wouldn’t be something a man of his age would wear, particularly without the rest of the uniform. I wish I could see it better, but it’s somewhat hidden by his jacket. They actually look alarmingly like they’re in a 2016 low-budget play set in the early twentieth century, where all the guys’ jackets are too big, because the costumer couldn’t find period-style suits, and the pants were left over from taller actors. Now I feel like my knowledge of costume history has been disturbed! As much as I enjoy sending you flying down a rabbit hole of research, I don’t mean to be disturbing. 😉 I’m sure what appears to be an odd fit on the left has a lot to do with the way he is hunched over. But I agree, the one on the right seems a little large to my modern eyes. Thanks for the link. I seem to recall posting other photos with similarly large jackets, but it was never clear to me whether it was the fashion, or something more like poor clothing selection or awkward tailoring. But these guys convey an air of men who know how to dress. Of course, they may be able to convey that without it being the case. 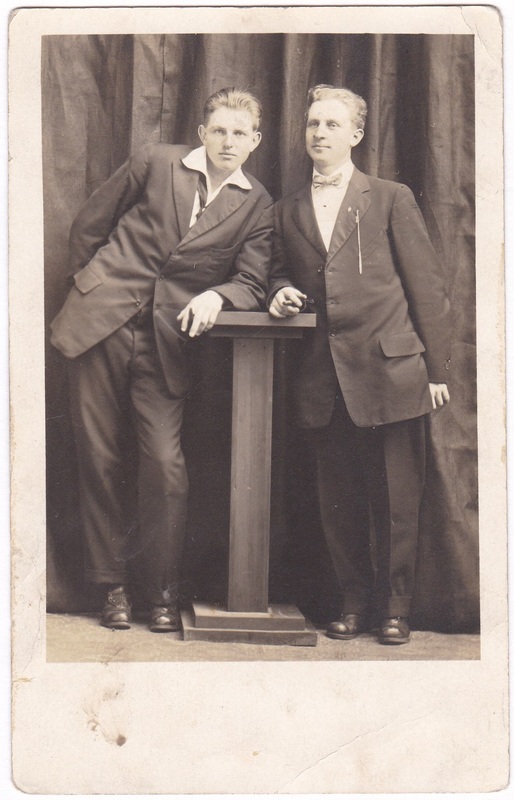 Is it a defect on the picture, or does the man on the right have something hanging from his lapel? It looks like a chain or cord with something long and thin at the end. ??? Yes, it’s some sort of chain, though I’m not sure what, if anything, it might signify. 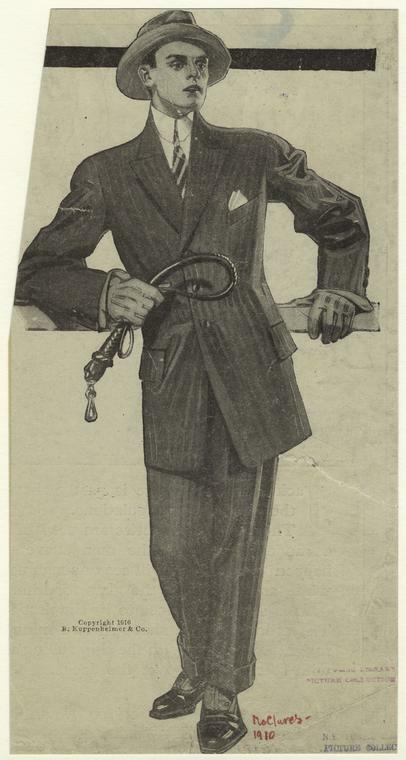 Funny–I was just told by a Knowledgeable Friend that the spread collar was called a Byron collar. I guess it depends on which part of the globe you’re on. I fully agree with peredwin’s description of their college student airs. re: “wandervögel”: could the photo be German, or is it definitely American? I’m not sure. Azo is a Kodak brand, and my completely unscientific searching indicates it was mostly used in the US and Canada, while Germans used German and other European brands at that time. But that doesn’t mean they aren’t German (or Germans visiting the US).